The roots of the “net neutrality” issue can be traced to two separate and largely unrelated developments, both chronicled in BusinessWeek. Abel then describes Madison River blocking Vonage in 2004 and SBC CEO Ed Whitacre's 2005 proclamation that content providers would have to pay extra to use his pipes. Abel tries to pretend that SBC, now AT&T, has backed off from Whitacre's position, ignoring that Randall Stephenson, Withacre's successor as CEO, has said much the same thing. Abel tries to use AT&T's agreement to some concessions in December 2006 in order for the FCC to approve its merger with Bellsouth as a sign of moderation, neglecting to mention that AT&T has already weaseled out of some of those "concessions". But the roots of net neutrality go much farther back; just because it looks like pipes to a bellhead like Whitacre or to Abel doesn't mean it is. 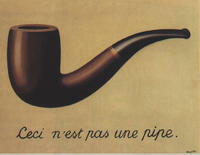 Magritte was right: ceci n'est pas une pipe (this is not a pipe). And what started the current controversy wasn't Whitacre's speech: it was the FCC revoking long-standing protections on net neutrality. The roots of net neutrality are the roots of the Internet itself, which arose as packet switching, flat-rate access, and peering competing with telco-style circuit switching, per-byte charges, and inter-carrier settlements. The end-to-end principle is an early distillation of what's different about the Internet: J. H. Salzer, D. P. Reed, and D. D. Clark, “End-to-End Arguments in System Design,” ACM Transactions on Computer Sys­tems, Vol. 2, Issue 4 (November 1984), p. 277. Translated into policy terms, it means universal and reciprocal access among the users connected to the Internet. Translated into political and philosophical terms, it means free speech, free association, and free trade. The roots of those ideas go much farther back, to Adam Smith and Socrates, for example. The current problem with lack of net neutrality started when the U.S. Federal Communications Commission (FCC) in 2003 revoked the Unbundled Network Elements (UNE) requirement for incumbent telephone companies. That killed off the three thousand or so Competitive Local Exchange Carriers (CLECs) that had sprung up in the previous decade. In addition, the FCC in 2002 reclassified cable modem access service, in August 2005 wireline broadband access service, and in March 2007 wireless broadband service to be information services, thus removing requirements to interconnect with other carriers, among other requirements. This removal of effective common carriage status is unprecedented in the history of the U.S. And these legal changes instituted by the FCC at the instigation of the incumbent telco and cableco ISPs are what have provoked the current concerns about net neutrality. a fight between one group of titans (the major ISP’s) and average people — people who wanted nothing more than to express themselves via the Internet. That's part of it, but he entirely misses that the point is participation: expressing yourself with others. And he misses that it's not just the incumbent ISPs that are the problem. Their attempt to do away with net neutrality needs to be seen in the context of media consolidation in which ownership of the majority of U.S. media has decreased from 50 to 5 companies over the past 20 years. This problem is also worldwide. The same FCC is trying to further consolidate U.S. media by the end of 2007, including holding an unannounced meeting that its own commissioners didn't know about until five business days before. Abel's position isn't moderate. It's a bunch of excuses for the cablecos and telcos to continue taking away the only free communications medium left: the Internet. Expressing yourself and associating with others through an open medium: that's the basis of self-government and free trade. Without the Internet, we won't have those. That's what net neutrality is about.